Mild excitement the other day as they put up a new telegraph pole at the end of our drive. In America they call it a "utility pole" but there's still something reassuringly old-fashioned about the concept, especially as the poles on our lane are made of wood. Here you can just about make out a very brave man, very high up. Cradled by modern technology that contrasts sharply with what he's actually putting in place. What a hero, I say. You learn something new every day. 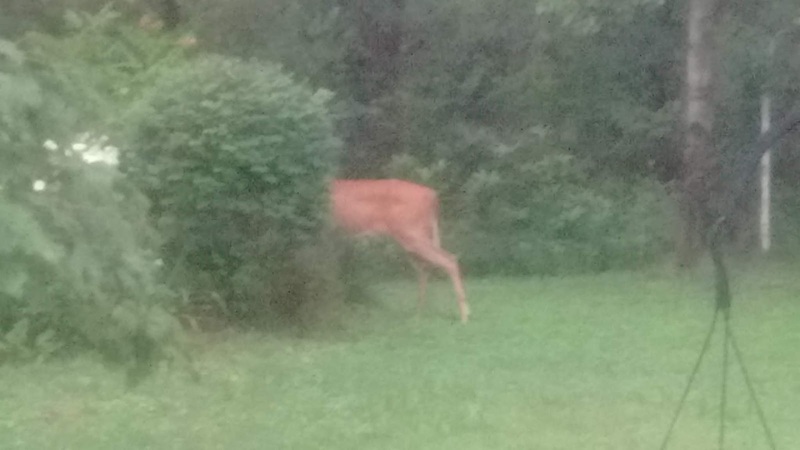 A number of my western New York neighbours are avid deer hunters. 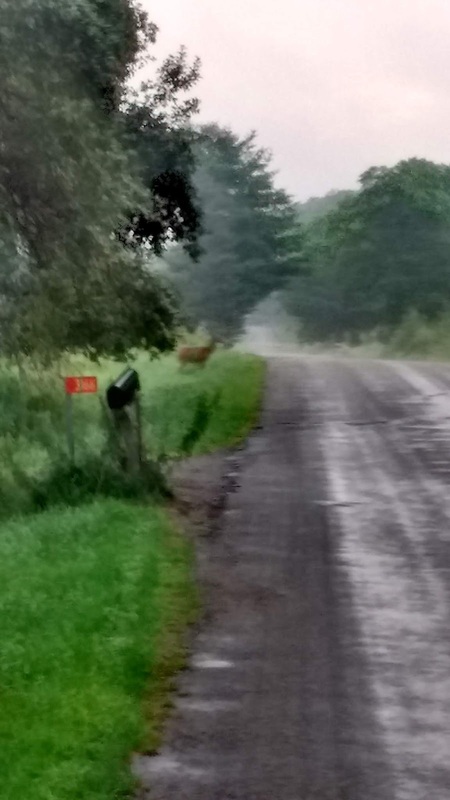 Deer season is a couple of months away yet and the deer know it. This morning I saw a couple of them sauntering across the lane heading towards someone's vegetable garden, smacking their lips. Then they saw me and bounced off into the woods, tails waving. They'll be back. Meanwhile the hunters are on the look out for some fresh trick to get an advantage over the opposition. Like this one spotted at a friend's house. 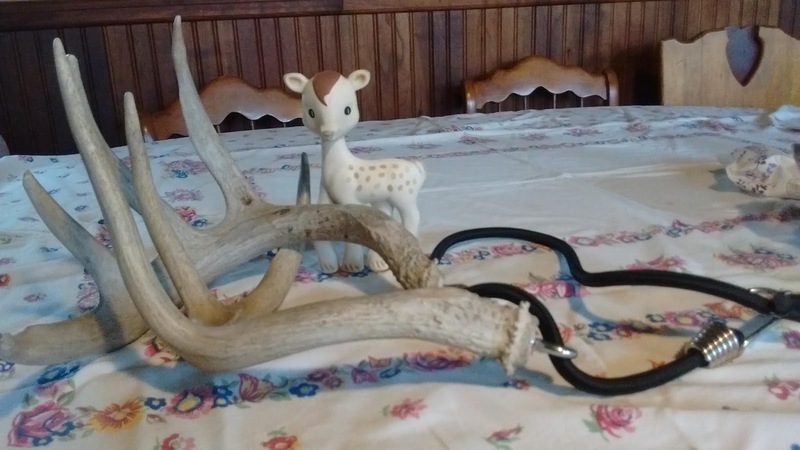 It's a sort of belt with a set of antlers at each end. 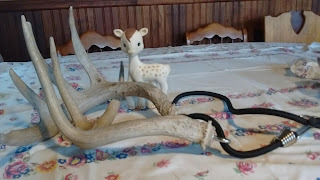 The idea is to put the belt around your waist and clack the antlers together. It sounds like two stags fighting. "I thought that would make them run away", I said. "Oh no", said my friend, "It attracts them". A rival stag will come trotting up to see who's causing trouble on his patch. And then, well you can guess the rest. It sounds a bit like wishful thinking to me but I'm not a hunter. Bambi doesn't seem too perturbed. Speaking of deer, the other evening we drove past the local University campus, St Bonaventure. There, in the pleasant park in front were hordes of deer. Some grazing, some snoozing on the grass. It was a deer cocktail party. Or deer freshers' week perhaps. 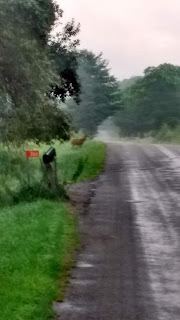 The next morning I walked up the lane and saw no deer at all. Then I remembered. They were all having a lie-in, or still rolling home, slightly the worse for wear. Despite many weeks of neglect and the predations of our four-footed friends, the jungle is putting on a surprisingly good show. The untidy English cottage garden effect has come into its own. And the hardy hybdrangeas are positively rampant. Even the delphiniums, usually eaten by slugs before they even have a chance to bloom had clearly flowered in my absence and even spread. This is telling me something. Perhaps I've been wasting my time gardening all along and should just sit back and let things be. Mind you, there was nothing there before I started planting, of course. Meanwhile, an unfamiliar visitor, ensconced in the daylily. I never thought I would hear myself calling a spider beautiful. I am a class A arachnophobe, especially when they're scuttling all round the boat and falling out of the sails and down my neck. (The spraying in the marina clearly didn't have a lasting effect.) But this fellow - well that's different. Plus it's outside and not moving. I'm reliably informed it's an Argiope Aurantia, which sounds exotic, aka a black-and-yellow garden spider, which doesn't. At any rate, it has a healthy appetite for flies and mosquitoes. Perhaps we should get more of them. Or then again, perhaps not. 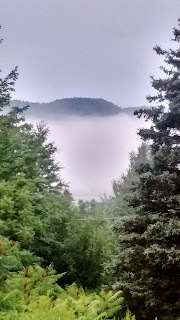 I set out for my first summer morning hike up the lane, wondering if anything had changed. As always at the back of my mind I was hoping to spot white tail deer. 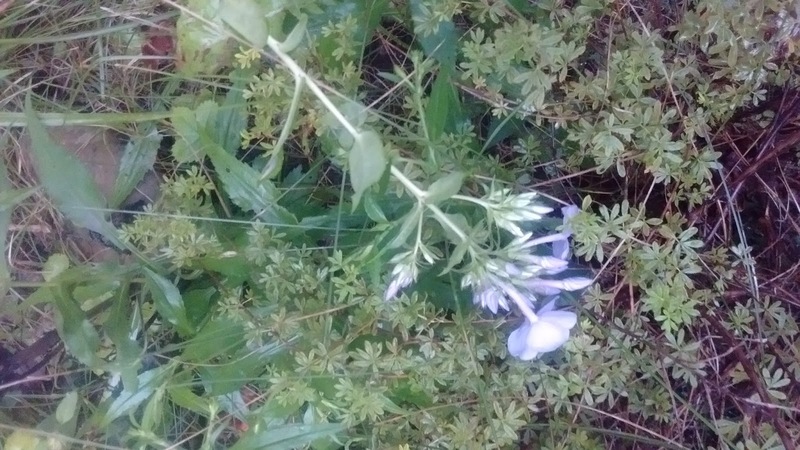 Such a nuisance in the garden (this summer's casualties include the buds of a whole bed of garden phlox) but so pretty when you catch them unawares - or vice versa - in the early morning mist. But the first morning there was nothing. A rabbit dashing across the road - a white tail but not the one I was looking for. A neighbouring cat sunning himself in a drive. He used to come and greet me but not this time. A distant honking of geese on the pond - surely not time for them to fly south yet? 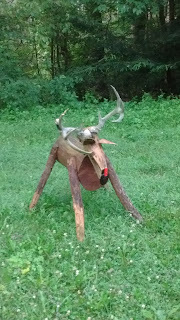 Here was my friend of old, looking a little awry.. But none of the real thing, save a tantalising deer cough echoing from somewhere deep in the forest. The next day was better. See - there on the verge to the left, just beyond the mailbox? Of course I never have my camera when I see them, only the phone. And if I ever do get to see a bear, you can be sure I won't have anything at all. 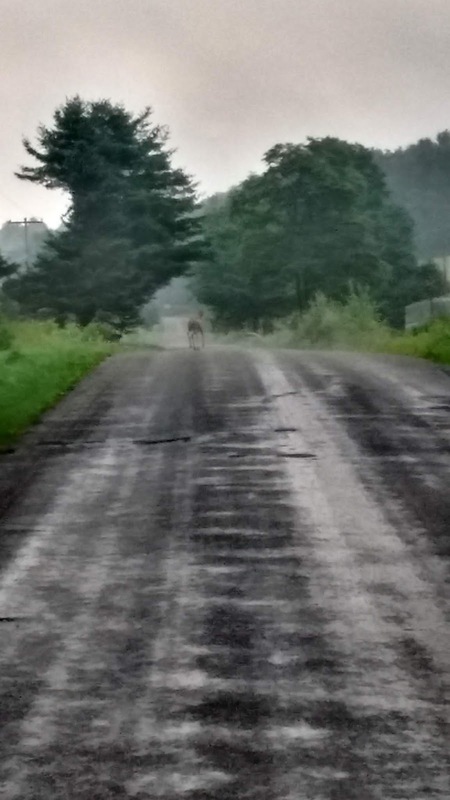 This deer was soon off, cantering across the road. The next day I saw more of them - a swish of white tails in the undergrowth, those wonderful slow motion bounds, almost floating in mid-air. I saw a turkey family too, the first for a long time. And the candy floss mist was covering the valley. Since I've been away the Five Mile Baptist church has turned from white to grey - someone's good idea no doubt. And our garden jungle is twice as overgrown as it ever was. But otherwise nothing much has changed. 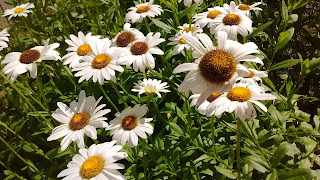 The blog is back at base, renewing acquaintance with old friends and overgrown gardens. Full service resumes next week. Watch this space!